There is so much confusion around dietary fat. Butter has been demonized for years; we’ve been told it’s a source of bad saturated fat, a source of cholesterol and to be limited in our diets. 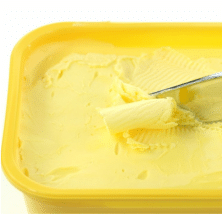 We’ve been taught to limit butter and replace it with “heart healthy” alternatives like margarine and aerosol cooking sprays because they are lower in calories. I write a lot about food, and provide a lot of suggestions, but when you truly break it all down I only recommend one thing: to eat real food. Eat food that is grown on the land, grazes on the grass or swims in our waters. Eat food in their most natural and unrefined state, the way Mother Nature intended, and avoid foods that have been refined or processed in any way. Although this suggestion might sound really simple, it often begs a lot of questions, especially surrounding fat. People can quickly understand that it is best to eat more fresh vegetables, fruits, nuts and seeds, but when it comes to dietary fats it often takes longer for people to comprehend. Butter is made by churning fresh cream. Margarine is made of vegetables oils that are heated, also known as hydrogenating, in order to make them solid at room temperature and emulsifiers, colorants and various artificial ingredients are added to keep it stable and prolong shelf life. 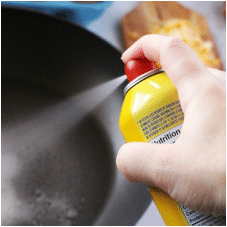 Cooking sprays are typically made of vegetable oils and are a form of an oil as a lubricant, lecithin as an emulsifier, and a propellant such as food-grade alcohol, nitrous oxide, carbon dioxide or propane. Of the three, which most resembles real food to you? Digging in a little further, below is a comparison of butter, margarine and cooking spray nutrition labels, using 3 common grocery store brands. Ingredients: Canola and sunflower oils 74%, water, modified palm and palm kernel oils 6%, salt, buttermilk powder 1% (milk), natural flavours, lactic acid, vitamin A palmitate (vitamin A), vitamin D3, natural colour, soy lecithin. Ingredients: Canola oil, modified palm oil, coconut oil, soy lecithin, rosemary extract, dimethylpolysiloxane, propellant (isobutane and propane). Looking quickly at the comparison above, here are some of the key takeaways. Butter is made of 1 ingredient, while margarine and cooking spray are made of a long list of ingredients. Margarine is made of several vegetable oils (canola, sunflower and palm) that are all liquid at room temperature. In order to be solid at room temperature vegetable oils must be hydrogenated or refined to remain shelf stable. The vitamins in margarine is synthetic, and have been added to help compensate for the fact that they are not naturally occurring in the product. 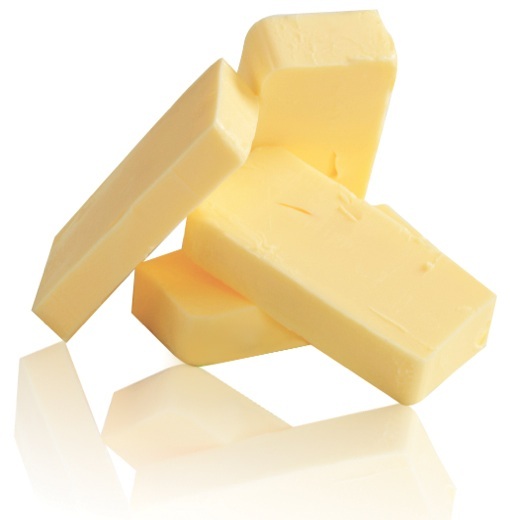 Vitamin A and vitamin D are naturally occurring in butter. Butter and margarine contain equal calories, while cooking spray contains none. This is because cooking spray is more chemical than food. Dimethylpolysiloxane, an ingredient in Pam, is the same ingredient used to make silicone products including contact lenses, Silly Putty and RainX. Butter contains the most saturated fat, and contrary to popular belief, this can be beneficial as part of a well balanced diet. Butter has many nutritional benefits, especially when compared to it’s processed alternatives. Butter is rich in naturally occurring fat-soluble vitamins A, which is essential for vision, the immune system, and cell growth, as well as fat-soluble vitamin D, E and K.
Butter contains healthy saturated fats, including short and medium chained fatty acids that are beneficial for energy, metabolism, as well as CLA which has been shown to have anti-cancer properties. The fats present it butter help us to absorb fat-soluble vitamins in other foods such as vegetables, so adding butter to your steamed vegetables can help increase vitamin absorption. Butter contains a good balance of essential fatty acids, containing more omega-3 than omega-6 fatty acids. In excess, omega-6 fatty acids (found in vegetable oils) can increase inflammation in the body. Butter is a real food, made from real ingredients. I don’t know about you, but I trust Mother Nature more than I trust chemists when it comes to my food. For more detailed information and research about butter, please check out these articles by the Weston A Price Foundation and Chris Kresser. Download my FREE guide to the 10 Worst Nutrition Myths of all time and get the facts that you deserve!